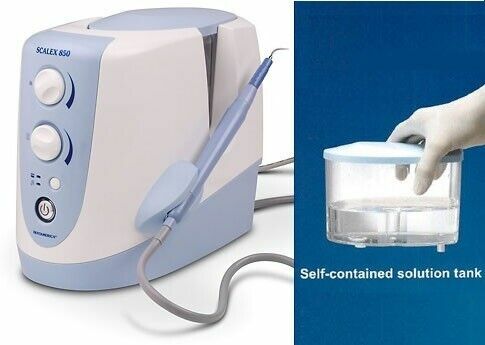 The Scalex 850 Self-Contained Ultrasonic Scaler has all the cleaning power you need with performance guaranteed for one full year. Self-contained solution tank allows for convenient portability and the addition of medicated solutions to scaler therapy. Automatic tuning activates inserts in a magnetostrictive cleaning pattern for feather-touch removal of calculus and stains under all loading conditions—no power loss under pressure. Each system includes base unit with graduated 1000ml self-contained solution tank, handpiece with extra-long 7 ft. cord and one 30kHz insert. 110V. One year manufacturer’s warranty.